This week is another political week in that we have meetings across the board involving the ECB and the Federal Reserve followed by the job numbers on Friday. All of these meetings, summits, announcements have an effect on the investment community in that investment funds tend to stay on the sidelines until the direction of the markets becomes clear. Alas, we suspect that by the end of this week the anticipated clarity will be as clear as mud. When it comes to the fundamental structural problems that need attending to, our political masters have only one objective and that is to remain employed, irrespective of the cost to the rest of us. We have long held the opinion that some of the smaller southern nations who are struggling under the European Unions austerity plans would have been better off out of the EU. However, even the partial dismantling of the EU would be like a red rag to a bull as politicians wish to grow their empires and not shrink them, thus rendering themselves as very important people. Sadly they have the power but not the brains, vision or courage to get us back on the road to recovery. Similarly in the United States where the government continues to work without a budget and instead focuses on the main prize of winning the next election. For investors this is a period of stagnation, one that is all talk and no action and begs the question of just what can we do about it? We made our decisions some time ago when we decided that the prevailing 'extend and pretend' policies can only lead to currency debasement. First we had the US dollar taking it on the chin, now we have the Euro taking a battering and in the process affording the dollar a little respite. As we all know fiat currencies sooner or later are recognized for what they are; worthless and slowly but surely they disappear. With that in mind we sought to place our funds into hard assets with our chosen vehicle being the ownership physical gold and silver. We also allocated some of our funds in the early stages of this bull market in precious metals to the producing stocks. This strategy has served us well, however, for the last few years we have not increased our exposure to the mining sector as the amount of risk involved in such enterprises was not been covered either by capital gains or dividends. More recently we have adopted various strategies for playing the options market in order to achieve the kind of leverage that stocks once provided. So we are happy to hold and accumulate the physical metal for the long haul and we also enjoy the boost to our portfolio that options trading provides. The difficult part to our strategy is determining when it will right to resume our accumulation of the mining stocks. We understand the mergers and acquisitions activity within this sector is alive and well with some of the larger companies acquiring some of the small caps. The difficulty here is that there are thousands of small operators available as takeover targets, but only a tiny few will qualify as suitable purchases. An investor will need to be on top of his game to select those particular stocks. Some of the larger more established companies as represented by the HUI are also having difficulty in finding any traction in terms of their stock price. This situation may be about to change. The downward drift of these stocks can only go on for so long and then one would imagine that the attractiveness in terms of profitability would be too much for savvy investors not to acquire them. Is that time now you ask? Well we are coming into a seasonally better time for gold and silver and one would hope that the stocks also benefit from any progress made by the metals. There are also a number of experts out there who are urging their readers to buy the stocks and they have been pro-stocks for some time. They are far more knowledgeable than we are and they may be right. Finally, if we take a quick look at the chart for the HUI and overlay gold’s progress you can see that the HUI is lagging behind gold. There is some catch up to be done by the stocks and this autumn may well be the time they put the effort in and close the gap. If you can’t handle the tension and must buy now, then please go gently, be selective and go for quality, build your portfolio steadily. 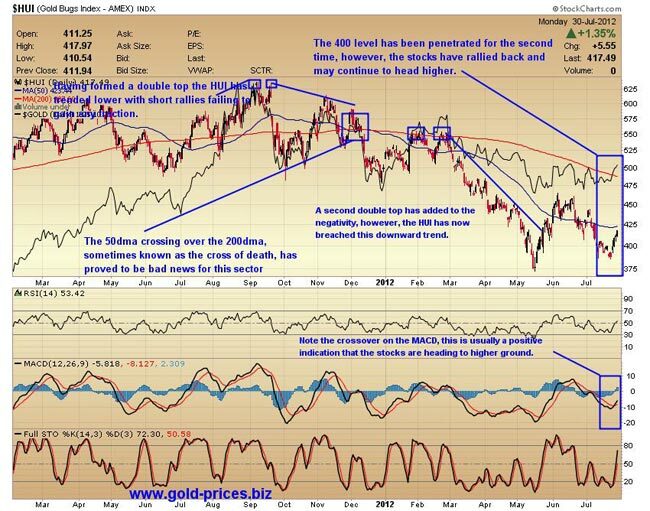 We are going back to the drawing board to ponder what could be the ignition for gold prices and when will it happen. We are also considering the possibility of leverage upon leverage, whereby we have gold prices heading higher and we select a stock that will move at say a ratio of say 2:1 or 3:1 to gold and then apply a well thought out options trading strategy on the back of that particular stock. In effect it could be a triple whammy. If that doesn't get our adrenalin moving then it’s back to the ten meter air pistol event at the London Olympics.